Please call the store at 1-561-995-2257 for more accurate delivery times. Sand-cast in gleaming hand-polished metal, Beatriz Ball's OCEAN Carmel Fish Oval Platter is embellished with a cute little fish. 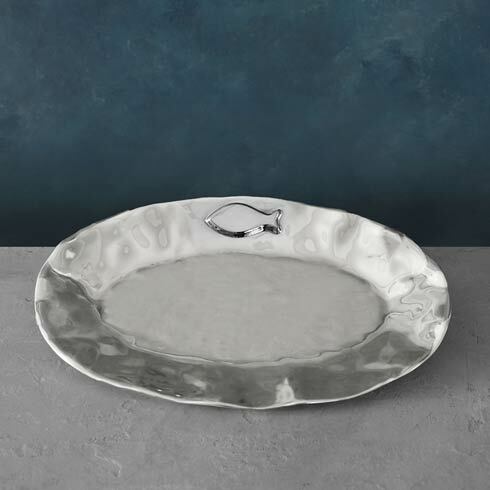 With an ample oval shape and a brilliant surface, the OCEAN Carmel Fish Oval Platter is ideal for serving your favorite seafood recipes in coastal style. Perfect for sushi. An ideal gift for the bride and groom, especially if its a beach wedding. An original design by Beatriz Ball, handmade of a top quality, FDA safe, easy-care, oven and freezer friendly aluminum alloy.